Everyone has a cola, but there is only one BOOST! Submit a story and we'll offer a 10% discount on a shipping order or send a Boost! swag to the author of the story. My family has been drinking Boost! since the early sixties in Burlington Twp. We could even purchase it at the shore when we went on vacation to Barnegat Light. It has always been part of our childhood and being part of life in Central NJ. Now that I've grown up and moved away to Central FL, I have cravings for a tall, cold glass of Boost!, especially after mowing the lawn on a hot day. Boost! boosts your spirits and and takes thirst away! Thanks for boosting my life! My Dad's birthday is coming up and he will be 93 . Very active and no health problems. He spends winter in Florida and Summer in Pennsauken, NJ . He has been drinking Tak-Aboost for as long as we can remember. We are going to Florida for a big 93rd Birthday party for him. He has requested we bring him his favorite drink.... Tak-Aboost. Mom is 91 and also enjoys a BOOST! I grew up in South Jersey and I've been drinking BOOST! since I learned how to hold a cup. Now I go to college in Dover, DE and drive up to Jersey just to buy BOOST! Absolutely amazing! What foods do you long for from home, stuff in your suitcase or beg visiting relatives to bring? The honor of craving a food we had never heard of belongs to Sue Cunningham of Raleigh. Cunningham, who grew up in southern New Jersey, outside of Philadelphia, misses Takaboost, a brown drink syrup that is mixed with water to create a sweet drink that tastes like flat soda. Cunningham says the drink was ubiquitous in her community; everyone served Takaboost at card parties and picnics. She replenishes her supply with the help of friends who often return to New Jersey but that doesn�t mean she is generous with the supply she has. and I tore into it like a 5yr old at christmas. That first cup of Boost! was the greatest thing I have ever tasted. With temperatures reaching 126+, that was, and still is, the best gift I have ever received! "I can remember going to Faunce's where "Boost!" was invented and hanging out after football/basketball games or on Friday and Saturday nights. You would order a Boost! and it would come with a real glass with a straw and a pretzel hanging from the straw. Boy...I think that's still one of my favorite drinks." Quote in the Riverside Positive Press from Paul Richardson of Surfside Beach South Carolina. I was happy to stumble across your website, and found it very user-friendly and easy to navigate. When I was little, I always remember going to my Aunt Lydia's house in Delran and having a ice cold glass of Boost! (we called it Drink Atoast then.) I absolutely loved the stuff and probably drank more of her supply than her own kids did! To this day whenever I taste that drink I am reminded of all the great times spent at my Aunt's house. When I went away to college my Aunt gave me a bottle of Boost!, and one of the original glass mixing/serving decanters (the decanter with the line painted on the outside so you knew exactly how much syrup to pour in.) Well, you would have thought she gave me a million dollars! I was so excited to have my very own supply of Boost! and found out rather quickly how much my roommate and fellow dorm dwellers liked it too! Uggh! My childhood memories from Burlington, NJ just wouldn't be complete without remembering opening up Nana's fridge and grabbing the staple glass jar of Drink a Toast. Especially on hot days when there was no air conditioning in the house, I'd sit out on the back screen porch and drink it with my Grandfather. For years I thought it was called "Tega Boost" (how the grown ups said it). I've been looking for the stuff for years and know exactly what I'll be sending everyone in their Christmas packages! My family has now spread to SC, GA, and upstate NY and we've tried to describe it: "tastes like flat cola-it's the best ice cold!". I remember the bottle was more rectangular in shape- with indents for your fingers in it and a wider mouth than a lite bottle has nowdays, with a metal lid perfect for making a bank out of (I think maybe someone must have). Cheers! I lived in Burlington County as a child then moved away for 33 years and then returned three years ago. While I was living in North Carolina, California and Washington DC I always returned home to take back with me a case or two of Boost! to hold me over until my next return. I LOVE IT! And just imagine my surprise when a co-worker told me that Boost! is now in a frozen drink. We immediately ran right out and got one. I thought I'd died and gone to heaven. I've been drinking Tak-A-Boost! since my mother put it in my baby bottle (I'm 44 by the way..LOL). 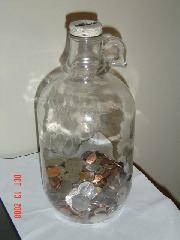 I don't have any real colorful stories but I do have a picture of my first piggy bank I wanted to send to you, a half gallon boost jug my mother made into a bank for me when I was very young, I'm still using it today! The labels gone but you can't mistake the design and it still has the screw cap with the slit for change! One time I do remember we dropped a gallon jug when we were unloading the groceries at home on the sidewalk after food shopping, immediately we drove back to the store and bought another, couldn't go a day without our glass of Boost! I grew up in Burlington. BOOST! was ALL that we ever drank!!!! I don't remember ever drinking koolaid and hawaiin punch was a once in a while treat while BOOST! was THE drink. We would make BOOST! snow cones, and BOOST! popsicles, BOOST! ice cubes, drink "milk and BOOST! ", BOOST! milkshakes, and even made BOOST! Ice cream!!!! I remember going camping and bringing cases of BOOST! but nothing to mix it in. But that was the easy part. . .a shot of BOOST! in a glass of water and we were very happy!!! I NEVER knew it was a regional thing. So, when my family moved to Los Angeles when I was about 15, I would go into EVERY store I could looking for BOOST!. Everyone would look at me as if I were crazy!!!! Never heard of it!!!! I was trying to describe it to my office pals and decided to google it and lo and behold your website popped up!!! I am SO HAPPY!!!!! I will be ordering some really soon!!!!! My name is Susan and I was born and grew up all over South Jersey, Burlington, Camden, Riverside, Collingswood. I love Boost!, but at the time it was called Drink A Toast. When I was 15 I moved to upstate NY and no Boost!. I visited family in Cinnaminson area and always managed to get a small bottle of Boost! to take home. In the late 80s, I moved to Orlando, Florida, and no Boost!. But family would visit from the area and manage to bring me some. I just had family visit this week and what do I find on my doorstep, two gallons of Boost!, one of which is nearly gone!! I can�t tell you how many great memories this brings back and tastes just as good now as it did when I was a kid. Thanks for keeping this memory and product alive!! Now that I can order on line, I will be getting Boost! on a regular basis!! You have made me very happy!! My husband just handed me a glass of flat Diet Coke tonight and said, "You should contact Coke and suggest they make a flat Coke product, you like it so much!" I said, "There already is one . . . or used to be . . . but better!" I decided to Google "Atoast" and was tickled to find your website and also that your product still exists. My mother lived in Burlington, NJ in the years before she married my father (1955), and in the late '60s when she took us back east for the only time, my Dad, brother, and I experienced "Takaboost" for the first time. We got such a kick out of the name . . . it was so goofily exotic to us young Vernors-loving Detroiters! (I prefer my Vernors flat, too). We brought home two jugs of the delicious syrup . . . and that was it. I have savored the memory since then. And the jugs stayed in our basement until my parents house was sold in 1990! I sure wish I could get it locally and introduce my family to it! WOW!!! I'm thrilled to have found this website! I lived in Florence, New Jersey until I was 7 years old (the summer of 1969) and my family moved to Ohio. I remember drinking lots of "teggaboose" as a young child, and it being a staple beverage in our home as well as our neighbors' and relatives' homes in Florence. I also remember being very disappointed at not being able to buy Boost! here in Ohio. Over the years when we'd return to Florence to visit family, we'd purchase Boost! and attempt to make our special "hometown" drink syrup last as long as possible after returning to Ohio. I recall telling my Ohio friends all about this incredibly delicious beverage, serving it to them, and having not one of them ever be as enamored as I about Boost!. Their midwestern taste buds were not used to such a treat, and the typical response to their first swig of Boost! was "ugh.....this tastes like flat pop". I tried, unsuccessfully, to introduce Boost! to everyone from childhood friends to college roommates; boyfriends and eventually my husband and two young children. The Ohioans in my life never embraced Boost!....which meant that I didn't have to share, so it really worked out well after all. 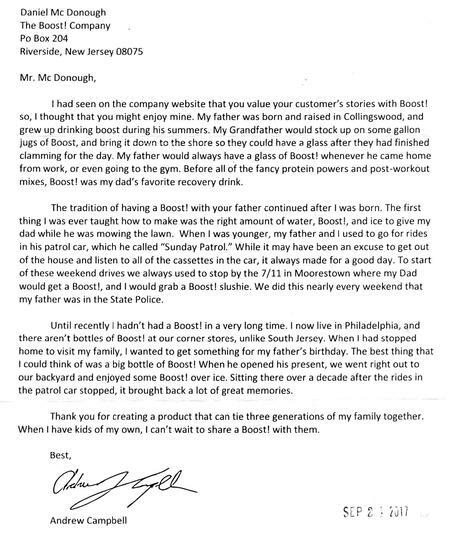 Now that my children are a few years older than they were the first time they drank Boost!, I'm hoping that their New Jersey ancestry will prevail and they too will become Boost! fans. As we're not big "pop" drinkers in our house, I think I have a better chance converting my kids than my husband, as his well-established taste buds still don't care much for flat pop. I'll be placing my order for Boost! this week. My siblings and I grew up in Levittown, Pa. in the 1960's with Drink-A-Toast, and enjoyed it immensely. My Mother worked for the Burlington County Times for 34 years, retiring in January '08 at 81 years of age. She would tell me at about 2:30 in the afternoon, she'd get tired. Her solution was to have a cup of 'Boost!' from the cafeteria soda machine. It would help her get through the day. 'Mom' passed away November 1, 2008. Finding your website, and remembering my 'Mom', and her love of 'Boost! ', helped get me through my day today. I grew up first in Florence NJ (1950s) and then in Burlington (1960s). Burlington had a BOOST! shop (Riggs) on High Street. Once, that closed, I think I remember that they sold BOOST! in the Burlington News Agency. It was also sold at basketball and football games when I was in high school. When I first moved to Arizona in the late 1990�s, I used to have it shipped to me.<?XML:NAMESPACE PREFIX = O /> I remember that the stores and the school had a dispenser for BOOST!. It had a black plastic base, and a clear or translucent plastic tank on top, square, with the Take-A-Boost logo on it. There was a tap on the front to dispense it. Haven�t seen one of those in many, many years. They sold it in a cup with ice, a long straw in the cup, and hung two pretzels on the straw. I was raised in Florence, NJ from the time I was born (69 years ago). I lived downtown, and when I was a little kid, I was introduced to Tak-a-Boost over at Joe Travia's neighborhood store. We (my brothers and I) would go over to Joe's, get Tak-a-Boost in one of those paper cones, in a metal holder, with a pretzel hung over a straw. This probably cost a nickel at the time. This is the classic way to enjoy Boost! For over 60 years I have been drinking Boost!. I lived in Kansas for ten years, but I would get a case or two when we visited family back in Jersey. Now we're in Delaware, so it's a lot easier to get. I'm convinced that Tak-a-Boost is the real fountain of youth! Why would everybody in South Jersey look so young? I'll never stop drinking Boost! Many memories I have of Riverside was my grandmother's two favorite things the Phillies, and Boost!. I spent most of my childhood in Riverside and it always seemed my grandparents had at least three gallons of Boost! on hand for my father. In the mid eighties we moved to the Nashville area, and we would come to Riverside every summer to see our grandparents. We had a Chevy conversion van and we always left Riverside with about 5 gallon bottles of Boost!, and that lasted my father for a while. Many great memories I have of growing up always seem to come back to Boost!, and for a short time we had Boost! at a local store in Tennessee. My father of course bought many of the bottles that they had on the shelf. Thank you for many great memories, and whenever I am back up I will have to stop in for a Boost!. I grew up in the Palmyra, and Riverside areas in the 50's. Boost! or Drink A Toast depending on which town you were in was all we drank. Sitting in either drug store with a glass of Boost!, and a pretzel was part of growing up in South Jersey. We moved to South Florida in the 70's but still order Boost! from time to time. Somehow, the taste brings back great memories of the Center, and the Riverside Fire House dances. Boost! to me is like taking my suitcase on Vacation. No matter where we went Boost! was part of our travel gear. Lets see. I have had it all the way from my original home in Palmyra to Atlantic City. Later as I went to Vietnam it found its way there, then back to Oklahoma and finally to my present home in South Florida for the last 20 years. Hi Gang, My memories of the Tak-A-Boost in Palmyra was just brought back to life. I was born at 729 Highland Ave. in Palmyra in 1/11/26. Although having enjoyed boost! over many years my main remembrance is having worked there after schoool while a student at PHS in my junior and senior years. That would be 1942 and 43. I worked after school as a short order cook under the tuteledge of Elmer who was the main kitchen guy. He was portly, always wore his white apron, and smoked a cigar. He taught me how to break eggs onto the grill , 4 at a time, 2 in each hand. He also taught me to cook hamburgers, etc. He was a great teacher and a great guy. Having entered the Navy in June, 1943 out of PHS, as did many of my classmates, I didn't return to Palmyra until early 1946 and the first place I visited was the Tak-A-Boost. It was still there right next to Rodgers News Store. Mrs. Gluyes, a wonderful lady, was tending the counter at Rodgers and gave me a warm welcome home. While in school I had classmates from the Faunce family of Riverside who originated and owned the Tak-A-Boost Shop. Another remembrance of the shop is that during Hi-School a dance floor was opened on the 2nd floor above the shop and at night after basketball games, etc. the kids would climb up the stairs to the 2nd deck and dance to the music of a juke-box. It was a real fire trap and I often wondered how the fire inspectors ever allowed it. There was no exit except down the rickety stairs and there were over a hundred kids up there, and I was one of them. In addition to the kids hanging out there after school drinking their Tak-a-boost with the pretzel hanging over the straw there was another aspect not known by many. They served a really good dinner menu...not fancy, but really good. That's enough nostalgia. Thank the good lord for the Tak-A-Boost Shop back in those years as it served to keep a lot of kids out of trouble and a place to meet friends. I grew up in a small Salem County town called Elmer. My grandfather was form Pitman in Gloucester County and he and my grandmother lived there for a few years in the early sixties. I remember having Drink Atoast at their house most every time we went. Gram would use her hand crank ice crusher to chip the ice and then mix the Boost! and water. She would add a straw and we would enjoy it. They always got their supply at a little neighborhood market called J&K on Woodbury Pitman Road. I had been looking for this product for many years and finally a friend discovered that the Acme in Glassboro sometimes had it. Hooray! I went and bought a galllon. My daughter and husband aren't quite sure why I like it so much. Not only is it good, but it brings back so many wonderful memories of Gram and Pop. I grew up in S.Jersey in 70's / 80's. One of my fondest life memories is fishing with my grandparents, generally in the Tuckerton area, always with plenty of Takaboost. I moved west to CA in mid 80's while still in high school. There were many culture shocks, but not finding Takaboost and other food items were the worst. I served six years active Navy and always sought it out wherever I was. I learned then it was a very geographic thing from talking with my peers from all over the country and resigned myself to go without for life. Sometime during my college years in WA state, it was discovered (or became available) we could order it direct. Because of shipping costs, we limited ourselves, but it was always a pleasure to receive for special occasions. Now, at 41 and living in OR, we order it more regularly. Life's too short to go without for too long! Thanks for keeping a great product going. Whenever I get down to Riverside, NJ to visit a friend or a relative I always pick up a couple of bottles. I was born in Riverside and grew up on it. It brings back many fond memories. Thanks for keeping the company going. I am really looking forward to getting this wonderful drink. I have missed it. Boost! is still my favorite drink on the planet + is unique + has a great flavor unlike any other drink. i'd always rather have a boost!. I'm 84 years old and it has taken me all these years to prove to my husband that there was a drink called Take-a-Boost (at least that's the way I remember it). I can remember drinking it after school in downtown Burlington NJ. in the early 40's. I moved to Philadelphia after graduation to work - these were the war years. My friends and I would go across the river to get a supply of Boost! every so often. After moving around in my years in the Navy, I married and settled down in Iowa. No-one in Iowa had ever heard of Boost!. After retirement, we moved to Florida and my husband would laugh at me when I would mention remembering Boost!. Now after all this time i am vindicated. I was just fooling around on the Internet and found you. I haven't lost my mind after all My next step will be to order some. I grew up in Burlington, NJ and was related to the Kelly's in Riverside, NJ. I graduated from Burlington High School in 1965 and used to go to Riggs on High St. in Burlington, NJ as much as possible. My dad was a mailman in Burlington, NJ (Francis Reds Ayrer) and after a hot day of delivering mail , he would take me to Riggs and Have a glass of Boost! with crushed ice and a pretzel. That was the best! Thru the years I have delighted with a glass of cold boost! and introduced it to other people through out the state when I taught my classes at Rutger's before I retired. I now live in Myrtle Beach, SC and always bring back a few gallons when I visit. Thanks for the good times and refreshing drink a toast and taka boost. I fell in love with this drink the 1st time I tried it and I still drink it today! I'm from the Riverside, NJ area and grew up knowing this drink!! I don't know of anyone who could say they don't love BOOST! The 50's Faunce's Store-We went "Down Town". It was "Drink Atoast" & "Take A Boost". It was ALL served in real glasses, with ice & 2 pretzels hanging on a straw. They even served "Milk Toast". This was served in a very large glass with 2 pretzels. Faunce's was a place for the Riverside High School girls from the 50's to hang out together, talk, have fun. That was what the 50's was all about. There will never be a time as wonderful as the 50's. Look what our children & grandchildren missed. Here's to us-the "teens of the fifties"!! Boost! was an important part of my growing up in Palmyra. When young, we sat and played games or colored for hours in the summer with our Boost! nearby, When we got older and could venture further from home, we walked down Parry Ave. and headed to Mc Allisters and the thrill of sitting at the counter with our Boost!. The years passed, and the love of Boost! grew. They didn't have Boost! in Bethlehem, Pa. where I went to college, but I did manage to find a girl from Riverside who also loved Boost!. Boost! lover Karen Bruckart and I have been married for 38 years. But I am moving a little too quickly, again. One Christmas break, I also was moving too quickly. Coming home for the holiday, I found the house Boost!less. I took my father's new Buick Electra, (You know, the one with the big V8) to pick up a gallon. I was zipping back to the house with the gallon on the front floor. It has been 45 years and I can still remember the sinking feeling as that precious gallon took one little roll and broke all over the front floor. Boost! tastes great, but it doesn't clean out of carpet easily and smells pretty bad when the days get hot. My Dad didn't keep that car real long. I still love Boost! and make a point of picking some up every time we pass through town. Thanks, and keep the taste and the memories coming. My family lived in Riverside from 1954-64. My father was the minister at the Riverside Moravian Church. Before we even moved there and were making our first visit we were introduced to Boost!. That probably helped seal the deal for my dad! My brother and I grew up on it. Nothing like that crushed ice and those thin pretzels on the straw. When we left Riverside and moved to Allentown PA, Boost! continued to be part of our lives; either friends would bring it to us or we would be sure to keep our supply when we would return to Riverside for visits. When I entered Moravian College after high school I started dating a "boy" from Palmyra...of course love at first sight was sealed with our common understanding of the importance of Boost in our lives. My husband Hank Naisby always had a gallon of Boost! on his college dorm window sill. Hank and I have been married for 38 years and Boost! is still a part of our life. Hank's family always vacationed on LBI so we were always able to find it there, but sadly within the last few years it has seemed to disappear. So we often stop at Flying Feather on our way to the shore. As life goes in circles, after my mother died at an early age of 52, in 1979, my dad remarried a wonderful family friend and member of the Riverside church, Colleen Workman Taylor. Dad and Colleen are current members of that church, but an additional twist is that my brother Richard Bruckart has accepted a call to be the minister of the Riverside Moravian Church and will be starting his ministry on April 3. He found your site as we were comparing our childhood memories of Boost! and how happy he is that he is moving back to Riverside and to the home of Boost!!! It really does bring out the memories in all of us. Too bad Hank and I don't have any in our house right now because we are both thirsty for it! I think a trip to Riverside will be in the future soon...and probably before the day of my brother's installation. If you want to welcome him the address is on Bridgeboro Street! I was born and raised in Riverside NJ. As a boy it was a real treat to go to Faunce�s for a vanilla milkshake flavored with Boost! syrup. That and a stick pretzel for 25 cents. That was back in the late 1950. I�m 62 years old and in our cupboard is a gallon of decaf Boost!. When Mr. Faunce the pharmacist mixed up the syrup to settle upset stomachs and diarrhea I wonder if he knew how many decades it would be a part of southern NJ history. I grew up in the <?XML:NAMESPACE PREFIX = ST1 />Pine Barrens, in Browns Mills, NJ. My aunts always made Boost! for the gaggle of kids that were always around. When I got old enough to go to camp in Delanco, NJ I was thrilled to find that in addition to �bug juice� you could always get Boost! in the Mess hall. Lots of fond memories and I�m so pleased I�ll be able to order it to be sent here to me in Wilmington. Thank goodness I can order Boost! to be delivered. I have enjoyed drinking your product since I was very young. I grew up in Edgewater Park and my mother was a teacher for Riverside High School. She would take us to the basketball games, where she was part of "crowd-control." I now live in Pittsburgh, PA. My 15 year old son (who was born and raised in the Steel City) is the one who reminds me that it is time to order more. Thanks again! My name is Ken Swope and I lived on Kossuth St., one street north of Faunces where I frequented many, many times in my youth and teen years. Drink A Toast, Tak A Boost! or just plain Boost! was the preferred drink in my town in the fifties and sixties. Served in a dixie cup to go or a glass to stay, was topped off with a straw and pretzel. The 'boost!' was made in a building next door to Faunces a short distance down a driveway. The old brick building housed the "secret" of Drink A Toast for many years. We played basketball right behind the building at the Fabricius' (sp) backyard but never gave a thought about what was going on in that building that produced the best thirst quencher we knew. This is just a portion of the many great memories that I have of this local drink. My sister, Linda, was one of the few "chosen ones" that served up the delicious drink from the porcelain, off white container with blue stripes. I can admit now with some guilt that my sister slipped me an extra pretzel every once in awhile. Thanks Mr. Faunce for the memories, a great treat and a fantastic place for our generation to meet and greet friends. I grew up in Riverside NJ and Burlington NJ until I was 15 and my parents decided to move to NE PA. I haven't had a taste of Boost! in 25 years since we moved and I now reside in Montgomery AL. My mom and dad are coming to my home tonight after a trip up north to see family and I made sure that they picked me up a gallon of Boost! for me. I'm excited like a kid at Christmas time waiting for today to end here at work. I cannot wait to enjoy a tall glass of Boost! tonight and let my wife experience some of my childhood. Makes me want to take her up to see the family which we haven't done yet and experience the places I used to go with my parents all around Burlington County and the shore. Thanks again for making such a great product and I can't wait till tonight! Thank you, take a boost (Tak-Aboost) for many great memorys of my teenage years in Mt Holly NJ not very far from Riverside where your great syrup was and still is made. When I was in my teenage years my brother David and I would go to a friend of ours who lived in Rancocas and their mother would always have cold Boost! in the fridge for us and others to enjoy in a tall glass with lots of ice. That was in 1967ish but I remember it like it was yesterday. Last time I went to visit my sister Beverly Cruse in Mount Holly I went to the fairground plaza with her husband Hank and was able to purchase two gallons of the original Boost! to take back to New Port Richey Florida where I now live. I got a large glass, added Boost!, ice, water and to my happy surprise, tasted the same great taste I remembered when I was 17. Thank you so much for that, not many things I can think of have stayed the same for so long. Thanks again from me and all others who love your drink. My whole family always enjoyed your family's product and it was served at every household. One of my fondest memories was one my grandmother gave me. She lived two blocks away on Cleveland Ave. and every day we would see each other and when we would walk downtown we would go into this soda fountain place and have a takaboost together. They always served it with a straw and two pretzels looped over it. I always used to bite off the "ears" of the pretzel first before eating the rest of it. Thanks to your family for that very fond memory I have of my Grandmother. Back in June of 1973 I took a Rafting trip down the Colorado River. It was six days on the River in the Canyon from Lees Ferry to Lake Mead. I Brought a Quart Bottle of Drink-A-Toast (Boost!) syrup with me and mixed with the Colorado river ; It was excellent. I just started High School at Holy Cross in Delran, New Jersey, and I'm 'In Yearbook', Staying after school some days to work on Yearbook pages online, with our innovative tablet PC computers. At the first after-school meeting, one of the Seniors took a look around the room and confidently smiled, "I think that everyone needs a Boost." Now, being a Freshman, I hadn't the vaguest idea what that meant. But the Sophomores were nodding eagerly, and honestly, I took my cues from them. They began to get out around $1.75, so I did too. Pooling our money, nearly everyone bought a boost, the seniors heading out to the nearest drug store. They came back with the slushes in white Styrofoam cups, and I tentatively took mine. I sipped it cautiously, having no idea what it would taste like. My eyes lit up at the sweet taste and cold feeling on my tongue. The rest is history. From then on, there's been a 'Boost! Chart,' a T-chart in which you can choose a small or large sized Boost! by writing your name under either category on the board. Boost! has been revered as a tradition, and as long as I'm a student at HCHS, it will continue. In 1957 my family moved to New Jersey. We moved to the newly formed Cinnaminson Township.The township has a “Welcome Wagon” which gave each new resident local information, a phone book and a bottle of Boost or Drink-a-Toast, I knew as both. Well that was the beginning of a lifetime love. As anyone who has lived within a 25 mile radius of Riverside, Boost was the soft drink of choice. I still have a “Glass” Half Gallon mixing bottle. I called the company and I was told they do not make the glass mixing bottle. My bottle is probably 40 years old and still make a perfect “Boost!”….. Ahhhhhh! Sweet! I buy the Gallon Jug, which last about a month or so. I am the one who drinks Boost in my family. My name is Kevin Thomas and a resident of Delran. I just wanted to share this photo with you. I am a member of the Delran Fire Department and Emergency Squad but I am currently deployed at the South Pole in Antarctica. I received this as a Christmas gift from my family and It was just the taste of home I needed while being away from my family. I just wanted to thank you for maintaining a great tradition and being such an integral part of the communities that you distribute to. Hello, I am 55 years old and currently live down in the mountains of Mountain City, Tn. I moved down here in 1973 from Edgewater Park, NJ and was born in Mt Holly. I also grew up drinking TakaBoost as as a kid and still make trips up to Delran a couple times per year to stock up on Boost! and pork roll, people down here in the mountains don’t know what I am talking about when I ask them if they want me to bring them back some Boost! or porkroll. I have a few friends down here now that will ask when I am going north so I can bring them some back. I look forward every year to going to my uncles furniture store in MT.Holly (Bill's Bargains) to look around and going to stock up on gallons of Boost! and bringing them south. My name is Donna and I was born and raised in Florence, NJ. I was brought up on Takaboost and later Drink Atoast. I married in 1964 and my husband was in the Army stationed in Hawaii. Our apartment was located on Waikiki Beach and we received our mail at a main location in the lobby of the building. I missed my favorite drink and asked my Mother to see if the company in Riverside, NJ would send some to me. They said yes and for the next 8 months I received a plastic gallon every month. The people at the front desk would ask me every month "what's in the box"? I would say just stuff from home. After becoming pregnant with our first child I decided to return to the mainland to have the baby. My husband would be moving back on base so we no longer would be receiving mail at our apartment. Three days before I planned to fly out I took two glasses of Boost! with lots of ice down to the lobby and told them this is what was in the box. After they drank it, this was their comment: "it's probably a good thing we didn't know what was in the box - some deliveries may not have made it to your apartment". In Florence one of the places to go for ice cold Boost! with a pretzel was the Crumpet Hut on Broad Street. To this day my two sons stop everyday at Bob's Deli in Florence Station to get a Boost! on their way to work. One prefers regular Boost! while the other likes the slushy version. Boost! will always be a part of our family. On Monday 7/8/2013 I will be 76 years young. I was born in Riverside at the local hospital and I entered school there at a school that is no longer a school but a senior citizen facility. My grandfather was Chief of Police in Riverside and during WWII there were few men in the community but I had my grandfather. When grade school was finished for the day I would walk to the police headquarters and meet my grandfather and he would put me to work. There was a traffic light in the center of the street and it needed switches moved during the day to regulate traffic and it was my job to move them for the afternoon traffic. I would sweep out the jail cells and clean up the meeting room upstairs and set the chairs up just so and wipe things down. I was thrilled to be part of the police department and work for my grandfather. I would be rewarded, for my slave labor, a trip to your grandfather's drug store on my way home for a Boost! with a pretzel on the straw and I was in heaven. I was introduced to your grandfather and I knew him as Doctor Faunce. They had a soda fountain in the drug store where you could sit and enjoy your Boost! and pretzel. but I am sure I had more than one. I was probably only 6 or 7 years old but this memory has been with me all my life and is one that I cherish dearly. I enjoyed the article in today's BCT and it took me back to happier and more carefree days in a time long gone but not in my heart. Thank you for your product and I wish you good luck in the future. P.S. my cousin, Karen Holzinger is married to Billy Faunce. I am 45 and I grew up in Delran/Riverside area. I remember as a kid drinking BOOST! every day. My mom always bought the gallon jugs of it. I think BOOST! is better than coffee if you need to wake up and it tastes awesome. We moved to Burlington Township, NJ from Wisconsin in the summer of 1967. Went to Amato’s Pizza in the old A&P Plaza near Lagorce Square where we were introduced to Drink-a-Toast. We ordered slices of pizza and Drink-A-Toast. Wow! To this day that was the best slice of pizza and the best drink to have with pizza and anything else. While growing up it was Drink-A-Toast we drank regularly. Moved to California after graduating from BTHS and it was then I realized that Drink-a-Toast was not a national product. Was I ever disappointed. Over the years, when I visited family in New Jersey I would pick up Drink-A-Toast. That first glass of icy cold Drink-A-Toast takes me back to the first time drinking it and the great times. When I introduced to my children, my son liked it but my daughter did not. Found a few years ago that we could order Drink-A-Toast to be shipped via telephone or internet. From then on we would have a regular supply of Drink-A-Toast regardless of where we lived. My son recently visited his grandmother in South Jersey. Guess what he picked up at Mattson’s… four bottles of Drink-A-Toast and brought them back to Connecticut. I can’t wait to get to his house to pick up my two bottles. My dad was born in Riverside New Jersey. And he went back to visit on a regular basis and every time he went he came back with Boost! and me and my three brothers got hooked. We also shared with three of our friends that we knew our whole lives. They owned a campground that my dad was the first camper at. We looked forward to having Boost!. The last time I had Boost! was when my dad paid for my whole family to go to Ocean City, New Jersey and we stopped in Riverside, New Jersey to see his family and stop at the Boost! store. My dad passed away two years later from cancer and now that I found this. I am extremely happy it brings back great memories and reminds me of my daddy. Some day when when I have a family of my own I will take them there. It has been years since I've had Boost!. I remember it from high school dances and warm summer days. I was introduced to Boost! when my family moved to Riverton, New Jersey in the 60's (I'm 66 now ) by one of the other kids in my neighborhood. We were hooked on it. It was all we drank as kids. I have moved all over the country and had recently learned from my brother (who lives in TX) that you could order this and have it sent. I've just got my first order and again love it. It is just what I needed. A good tradition that continues to carry on. I was born and raised in Riverside and remember with great fondness going to Faunce's luncheonette with my parents to get a glass of Boost!. At that time, you couldn't yet buy the syrup, so it was a real treat to go to Faunce's where we would enjoy Boost!, served with a straw and a pretzel on the straw. I don't remember exactly when the syrup was made available for sale to the general public, but I was sure happy when we could make our own Boost! at home. At one time the product was called Drink-a-Toast, then Tak-a-Boost, but we always called it Boost!. I moved to North Jersey when I was 30 and luckily Boost! delivered to my home, or if I went home to visit family, I always picked up a few gallons. Now I'm in Pennsylvania, and I still get my Boost! delivered. There is nothing on the market that tastes like Boost! I'll bet no one from my background has a story. I was born and raised in South Philly. When I was a kid, I had family in Riverside. To me, at that time, Riverside was the country. My sister and I used to take two weeks at a time, separately, to stay with my Aunts in Riverside. I loved it there yet I was raised in South Philly. No one in my neighborhood ever heard of Boost!. I stopped going to Riverside in 1970 since I'd entered high school that year in Philly and started hanging on corners with my friends. I continued visiting my Aunts and other family until they all passed away and they always had Boost! in the house. It's been many years since I've had Boost! but I never forgot about it. Someone from Cinnaminson mentioned it to me just the other day so I Googled it and I'll be heading up to Riverside to pick up a few gallons at a retail location. Can't wait to go there for it. It's going to bring back memories just to drink it. I'm now 58 years old. My name is Eric, when I was a young boy my older brother Phil said to me " what stinks is when the ice cubes melt my Boost! gets watered down" so I told him we should make Boost! cubes. He said that was a great idea! So that's what we from then on. I'm 48 now and sad to say I haven't had Boost! since then. I love that drink!!! Oh yeah we enjoyed Boost! on Norman Ave around the corner from the White Eagle Tavern. Those were the good ole days!!! I was born in Mt. Holly and spent my first 7 years on Neck Rd. outside of Burlington. I was born in 1945, so we're talking 1945-1952. Sometimes my mom, sister and I would meet dad at the train station (he worked in Philly) and all go to Riggs Drug Store/soda fountain for dinner. I'd have a tuna on toast and a Take a Boost. Always the same. We would always keep a bottle of Boost! or Drink a Toast mix ( forget which it was called in the early 1950's) at home. It was about a quart size. It was so great over cracked ice in the summer. We moved to Cherry Hill in 52' and I lived there until college in 1964 but we always kept Drink a Toast (or Boost!) in the fridge. I think it's unfair to compare it to flat Coke. It's unique and (my memory tells me) delicious but I haven't had one in maybe 40 years. I now live in LaCrosse, Wisconsin and I order my Boost! delivered by UPS. I grew up in Burlington and went to (then) Burlington High School, Boost! has followed me all over the country and Canada and Mexico. It's the best and I am glad I can receive it wherever I am. Thanks again for a lifelong Product that I am still mixing and drinking. Hey, delighted to find the website! I'm a 4th generation Rivertonian now living in Ocean Grove, Monmouth County. I have a brother in CT, and a sister in GA and we've been drinking Boost! all our lives, as have our parents, aunts, and uncles! I don't have children myself, but my siblings do, and my nieces and nephews LOVE Boost! I remember when it was called Drink-A-Boost ... Anyway, my sister in Atlanta just texted me tonight because her kids are asking if there's Boost! in Ocean Grove! I'm on a mission to make sure they have it when they visit! My parents sadly no longer live in Riverton ... so, any chance of getting some of that nectar of the gods shipped out to me here down the shore? Yeah Boost! I just stumbled onto your website after Googling "Tegaboos" as I remembered it. I lived in Palmyra NJ in the 50's and we used to buy it at the local penny candy store. As I remember it, they served it from a blue tinted crock type dispenser. 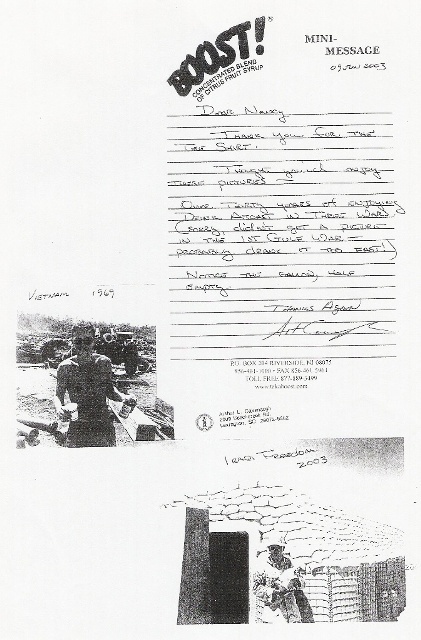 Seeing some of the letters from servicemen who enjoyed it overseas made me think, If we only had the internet when I was in Vietnam. Takaboost might have made the treated water we had available more palatable.All we had was Cool Aid or Iced Tea mix sent from home. My son Nicholas and his girlfriend Kelly went to Palmyra's prom on Friday, May 19. They had to pose with their favorite beverage.....that just so happened to match their attire! Growing up years ago on the corner where Palmyra meets Riverton, my siblings and I practically lived off of Boost!. We would walk to Charles Street school with a Boost! in hand, and walk back after school to ask mom for money so we could go buy another one. We always had a rule, the first quarter of the cup was the syrup, then half the cup was to be filled with the slushie, and then we would interchange between syrup and slushie until the cup was full. Now going off to college, I plan to set up a few bottles of the always trusted Boost! syrup not only for personal use but to spread the good word. I hope only that Boost! never gives in to big business, and forever remains New Jerseys greatest treasure. I grew up in Moorestown,NJ. My dad was born and raised in Camden. One of the first things we did on our way out of town or coming home was stop and buy a glass bottle of Boost!. (dad called it Drink-a-toast) It's was always in our lives until we moved to the south Alabama coast. I still pick up Boost! when I visit family but it's never made it this far south. Lol. Maybe I can introduce it in Gulf Shores to all the restaurants, I know people would love it as much as I do. There are things that you never forget from growing up and a iced down glass of Boost! is one of them. Thank you for keeping my childhood sweet. What a surprise! My husband was reading the Phila Inquirer today & asked me if I ever heard of a beverage called Boost!. I was scanning my memory & said I think so --- maybe ---- & asked why? He said he was reading an article "Do you need a little Boost!"? He said it was a nutritional drink. I immediately said I remember a beverage my Mother would give me in the late 50's early 60's called "Drink-A-Toast". We then resided in Levittown NJ now Willingboro NJ. Of course I Googled & there you were. From Take-A-Boost to Drink-A-Toast to BOOST! I am amazed the memory came back to me. I remember my 10th Birthday Party with my many friends from Stretton Circle in Levittown NJ. Pizza & Drink-A-Toast concentrate & water by the pitcher with ice. How about that!!! We moved to PA & I always wondered what happened to Drink-A-Toast. Glad you survived. Thanks for the happy memory. Great article too. BTW I am 66 now - so that was 58 yrs ago! At yi yi !!! Both of my Parents were born in Riverside. So we are life long Boost! drinkers. For as long an I can remember, My Great Grandmother had this bottle. I have many fond memories of going to their house and drinking Boost! from it, somehow the Boost! tasted better to me coming from this bottle. I keep this bottle on the self in my kitchen as a reminder of the time spend with my grandparents who are no long with us. I felt compelled to write you a note and say thank you for your product. I am currently pregnant with our third and each time I have been so ill I can not keep down any food or water. This has lead to long hospital stays , home nurses and stress on our little family. However, with my first pregnancy after I was rehydrated at the hospital the only thing I could keep down was pure Boost! syrup! I grew up with Boost! but never really drank it as a teen or adult, that all changed when it became my life line! With all my pregnancy’s Boost! has been able to calm my stomach and allow me to feel well enough to sip broth or eat some bread. I can not tell you how amazing this is, as I write this I am sipping my Boost! syrup on ice. So thank you for your product, your service to this community and for helping me feel normal again amongst the sea of first trimester sickness! I was so happy to find Boost! today at the Acme in Woodbury, NJ. I posted pictures on my Facebook page to share with my family. Tak a Boost brings back so many happy family memories in Riverside. We are having a family picnic on July 7, I am so excited to share this with our younger generation. I even went out a bought a couple gallon size cooler jugs. I cannot express how it warms my heart you are still making this. I have a million from when I was little going to Vacation Bible School in Burlington and having Boost! for a snack with pretzels to middle school when I would take it in my thermos to school to high school when I would have it at all of my parties to college when I would take 5 gallon jugs with me. I remember shipping jugs to family all over the Country, putting them in the car and taking them to Florida or down the shore. The best memories I have are the ones that I have shared with my own children. We live across the bridge now and Boost! Does not exist over here. We’ve imported it and I didn’t realize how much my children loved it until my oldest got her license and she would take the two other siblings across the river to get their Boost! You have become part of the family! We love you! Note: Photos and stories should come with permission to print them on this website and in future advertising. © Copyright 2007 - 2018 THE BOOST! COMPANY. All rights reserved.